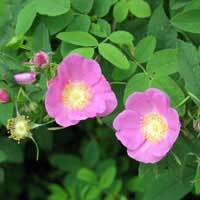 Although called swamp rose, this rose can live in moist non-wetland areas as well. It has red attractive fruits that persist in the winter. The flowers and fruit tend to be clustered (photo does not represent this characteristic). Pink blooms and this rose can form thickets.